Little Auk or Dovekie is a tiny auk of northern waters. It is a stocky bird, short-necked when on water. In breeding plumage, the adult has black upperparts, head and breast, and white belly. We can see some white edges on black short wings. Underwing is dark. It has small, rounded black tail. The conical bill is stubby and black. Eyes are black with white crescent above. Legs and webbed feet are pinkish-grey. In winter plumage, the adult has black upperparts, head and face, and black neck collar. Chin, throat and cheeks are dirty white. Underparts and undertail coverts are white. The juvenile is browner and resembles non breeding adult. We can find two subspecies, Alle alle alle very similar, and Alle alle polaris, larger, with longer bill and wings. 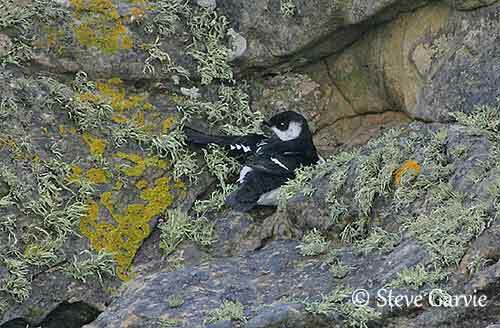 Little Auk or Dovekie is silent in winter and away from breeding colonies. During the breeding season, a variety of calls are given, such as twittering, chattering “kri-ri-ri-kikiki-kik-ki”. Alarm call is a whinnying “whuwhuwhu”. The young birds utter a high-pitched peeping call. 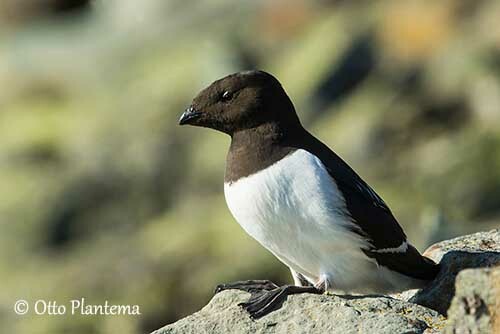 Little Auk or Dovekie breeds among screes and on steep slopes. After the breeding season, they disperse over polar seas with broken pack-ice. In some winters, they may disperse to south of their range. They are seen inland after severe winter storms. 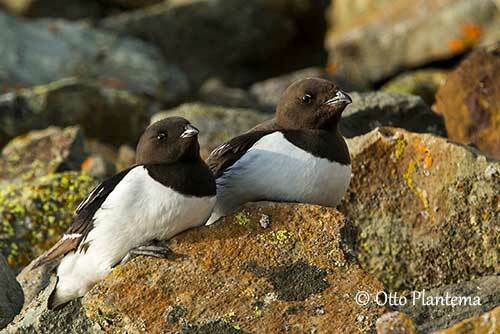 Little Auk or Dovekie breeds in Greenland and Arctic coastlines, but there is one colony in Canadian Arctic. They winter at sea from Newfoundland to Gulf of Maine, sometimes farther south to New York or Virginia. Also found off northern Europe. 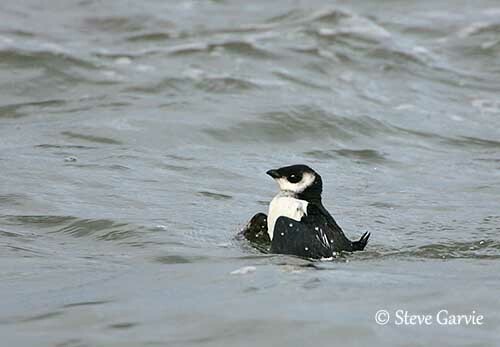 Little Auk or Dovekie feeds on plankton, small crustaceans and marine animals. This little bird dives underwater to catch its prey. It swims with its wings and forages for food under the surface. When it swims or rests on the water, it often dips its bill into the water. When on land, it is relatively graceful and walks easily. During the stormy season, it becomes very fat, when the sea washes up abundant supply of food. They collect in very large flocks when they leave their breeding sites, as well as they return. When alarmed or excited, Little Auk or Dovekie raises its head. Usually, this bird has a hunched appearance. The stormy weather in autumn can drive very numerous birds into the North Sea. But the Little Auk my also be blown inland and they are seen on roads, in fields and gardens. Sometimes, they are many hundreds of birds blown by bad weather. But more commonly, small wrecks occur every year on the east coasts of Great Britain, in October and January. These birds frequently look rather miserable and sick, some days after the gales, flying fast and low over the water, or sitting hunched-up in calmer waters. This species is highly gregarious and lives and nests in spectacular vast colonies. They perform synchronized flights, with several thousands of birds over the breeding colony. They are extremely vocal, uttering hysterical trilling calls during these intense movements. 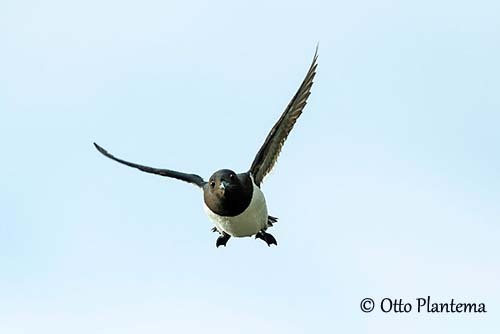 Little Auk or Dovekie flies well and rapidly, despite its small wings. It may take-off from water without running across surface. It flies low above water with rapid whirring wing beats. The breeding season occurs from late February to early May, according to the spring arrival at colony. The laying occurs in late June and the chicks fledge in late August. 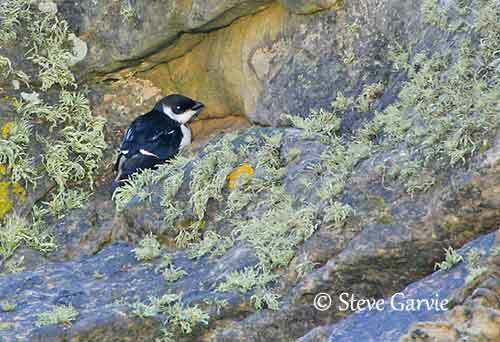 Little Auk or Dovekie nests in large colonies, in cavities in steep slopes. It nests in rock crevices or under large rocks. Greenland is the main breeding site. Colonies can be found on the coasts or on mountain slopes as far as 30 km inland. The female lays only one egg, on the bare rock or on pebbles, near the end of a passageway. The incubation lasts about 29 days, by both parents which take turns four times a day. The chick is covered with blackish brown down, and belly is paler. Adults feed the young, carrying food in their throat pouches. Young fledge when it is 26 to 30 days old. This species produces only one brood per season. 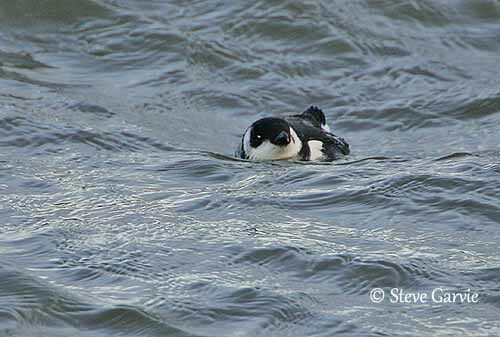 Little Auk or Dovekie feeds mainly on crustaceans and zooplankton, but also on small invertebrates and small fishes. 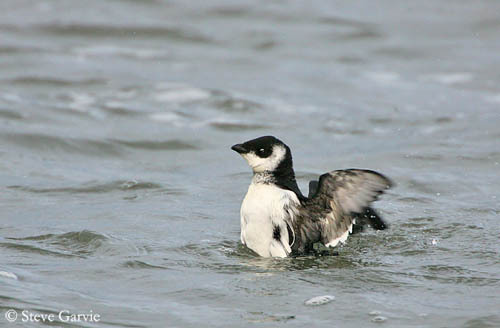 Little Auk or Dovekie is vulnerable to oil pollution when it dives for food. Raven, Glaucous Gulls and Arctic Foxes are important predators of this species, and polar bears feed on the eggs. The predators wait for the bird at the entrance of the cavity nest. At sea, they are preyed upon by Beluga Whales. Climate changes seem to play an important role in the decreases of some populations in southern Greenland, Iceland and Norway, due to global warming. 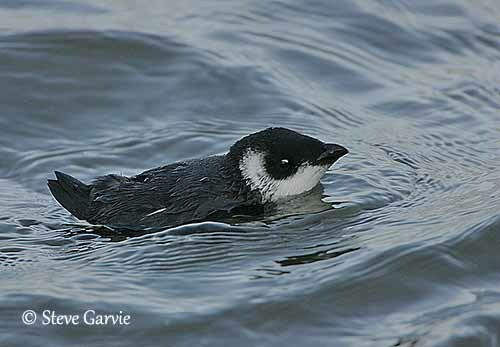 Little Auk or Dovekie plays an important role in the Arctic ecosystem, carrying large quantities of nutrients from sea to land. The areas close to large colonies show concentrations of vegetation attracting many insects and herbivores.